The Lawrence Free State Firebirds not only enter their first round playoff game with the confidence of knowing they have a much better record than Shawnee Mission Northwest, but they also have the confidence of beating the Cougars 20-3 in the second week of the season. However, beating a team twice in the same season can be tricky and the Cougars are likely better than their 3-6 record appears. Shawnee Mission Northwest is on a two-game winning streak after beating Shawnee Mission North and Shawnee Mission West during districts. Four of the Cougars’ six losses were within 10 points. The Cougars led Free State 3-0 at halftime in that earlier meeting. Northwest quarterback Jake Horner has passed for more than 300 yards, but he is a bigger threat in the return game. Horner has returned two kickoffs and one punt for touchdowns this season. Free State’s only loss came 26-19 to Olathe North. The Firebirds are led by quarterback Joe Dineen, who has passed for more than 1,200 yards and 16 touchdowns. He’s also rushed for 654 yards and nine touchdowns. Keys for Free State will be to avoid turnovers and keep Northwest’s return game in check. Potentially the most intriguing match-up of the first round of the 6A playoffs features Olathe North at Blue Valley Northwest. Mike Zegunis’ Blue Valley Northwest Huskies are one of the hottest teams in the state having won six straight games since consecutive losses to Gardner-Edgerton and Bishop Miege. 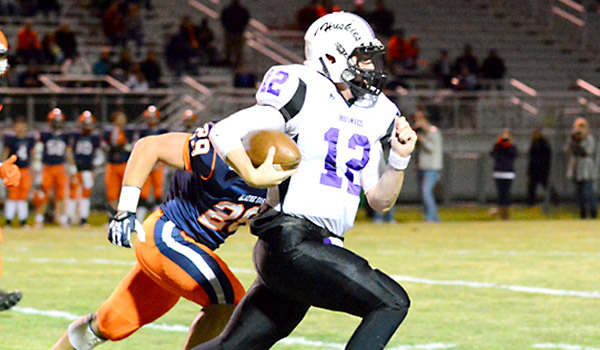 The Huskies get it done on offense and everything flows through quarterback Jacob Rominger. The 6-foot-4, 200-pound senior has thrown for more than 1,300 yards and 14 touchdowns, but also has the speed to beat teams with his legs. Northwest averages 230 rushing yards per game led by Miles Alexander. The junior back leads the Huskies with 1,265 yards and 12 touchdowns on the season. Jaquwan Stone is Northwest’s deep threat having hauled in 35 passes for 694 yards and seven scores. The Huskies offense will face a stout test in an Olathe North defense that is only allowing 14 points per game. North finished second in the Sunflower League against the run giving up just 102 yards per game, but last against the pass. The Eagle offense also averages 230 yards per game on the ground and like Northwest is led by a talented junior back. Venus Triplett has rushed for 1,237 yards and 20 scores this season. Quarterback Cole Murphy provides a dual threat for the Eagles having thrown for nearly 1,100 yards and rushed for more than 650 more. Olathe North’s three losses have been by a combined seven points. Blue Valley Northwest fell 34-14 to eventual champion Shawnee Mission West in the first round last season. If the Huskies are to advance, they’ll have to solve Jimmie Swain and the Olathe North defense. Maize lost 33-31 to Hutchinson last week, but sneaked into the playoffs by winning the district title on points over Garden City and Hutchinson. The Salthawks missed the postseason for the first time in 14 years. The Eagles defeated Dodge City 17-14 in Week 8 before last week’s loss ended a five-game winning streak. Maize has enjoyed a two-win improvement from last year. Chase White rushed 21 times for 138 yards and two scores and quarterback Connor Lungwitz completed 19 of 34 passes for 238 yards against Hutchinson. This is Manhattan’s 29th all-time playoff appearance, tied for third most in Kansas history, according to preppowerindex.com. The Indians have made the postseason six consecutive seasons. In that span, the Indians have gone 3-2 in first round games, but have never made it past the second round. These two teams have matched up twice in the state playoffs in the last decade, in 2009 and ’06; Manhattan won the contests 35-6 and 17-10. This time, Maize earns a close win behind the big-game running of White. Wichita Heights lost 28-6 to Derby last week even after Panther all-state running back Tyler West left the game three carries into the third quarter. Garrett Xanders stepped in for West and rushed for 110 yards and three scores. The Falcons have made nine playoff appearances in school history, all since 2001. Terry Harrison has done a nice job after he took over for coach Rick Wheeler, now the school’s athletic director. Heights has played in multiple low scoring games and has allowed 126 points and ranks fifth in Class 6A in scoring defense. Topeka has stayed on track after a school record 9-2 season last year under Walt Alexander. Topeka is one of six Class 6A teams that finished with one loss (no one has a perfect record) and has outscored teams 332-140. The Trojan offense ranks fourth in the classification. However, Heights has played the No. 9 SOS in the classification, Topeka No. 29. Wichita Heights delivers a victory in a grind-it-out contest.